The Chicago Bears are in the middle of one of the worst seasons in their long, storied history. Since the NFL schedule went to 16 games, the Bears have always had at least four wins. Ten games into this season, they're only 2-8 and have yet to win a contest away from Soldier Field. For quite some time, the Bears were known for their running game and intimidating defense. Running legends like Walter Payton and Gale Sayers dazzled in the backfield, and there's been no shortage of defensive standouts over the years, from Mike Singletary to Brian Urlacher. Over the last quarter-century or so, though, the team has always had inconsistent play from the quarterback position. No one has epitomized that more than Jay Cutler. After coming over from Denver in 2009, Cutler has more or less been the starting quarterback for the Bears. He's only played in all 16 games once, and this season will go down as his worst. He missed five games earlier this year, and the team just announced he has a torn labrum and will likely miss the rest of the season. Through eight seasons, including the playoffs, Cutler's win-loss record is 52-52. During that time, the Bears have paid him $103.8 million. That's almost $1 million per game – $998,077 to be exact. That's quite a bit of money to be paying a guy with just one career playoff win. Of course, football is a team sport, and Cutler has had his moments. He's the franchise leader in wins, career passing touchdowns, yards, and game-winning drives. On the flip side, Cutler makes some incredibly questionable throws, ones that a 33-year-old veteran quarterback shouldn't make. He also tends to fumble the ball a lot and has occasionally had some sideline feuds with coaches or fellow players. The Bears haven't done him any favors, either. In recent years, the once-vaunted defense has become anemic, ranking among the league's worst in several major defensive categories. Meanwhile, the team has gone through six offensive coordinators in Cutler's eight years under center, which is no way to develop consistency. It finally looked like Cutler seemed comfortable in the offense last year with Adam Gase as offensive coordinator. He passed for nearly 3,700 yards, tossed 21 touchdowns and had just 11 interceptions, his fewest in any season in which he played in at least 15 games. However, Gase left to take the Miami Dolphins job, and Cutler was once again forced to learn a new offense. 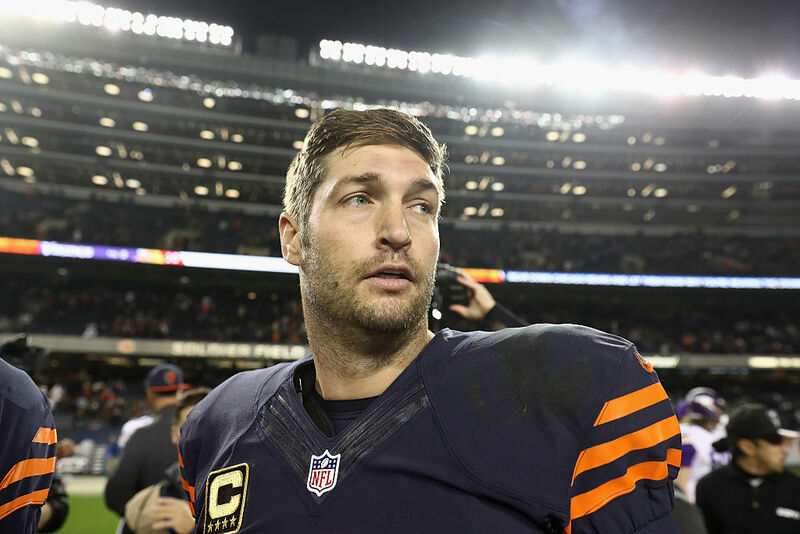 Though he's under contract through 2020, Cutler may have played his final game with the Chicago Bears. If that's the case, he'll go down as one of the biggest enigmas in franchise history – frustrating at times, dazzling at others.